The United States government has long encouraged companies to invest in developing new or improved processes by providing certain tax incentives. For years, the Research and Development Tax Credit was a provision that required yearly re-confirmation from Washington. The recently passed Path Act of 2015 and the Tax Cuts and Jobs Act of 2017, made this tax incentive provision permanent. Technical Risk and Economic Risk needs to be present. A company’s ability to claim the R&D Tax Credit is based on the risk of technical failure. The R&D Tax Credit rewards companies based on their attempt at designing or manufacturing a new product, not their success. In addition, a company must bear the economic risk of their product or process development as well. In other words, a company must get paid based on their success, not their attempts. Usually, companies are paid on a fixed-price basis which signifies that they bear the economic risk. Elimination of Uncertainty – Activities meant to discover information to remove uncertainty regarding the capability or method for developing or improving a product or process, or the appropriateness of the product design. Technological in Nature – Activities must fundamentally rely on principles of physical science, biological science, computer science, and/or engineering. 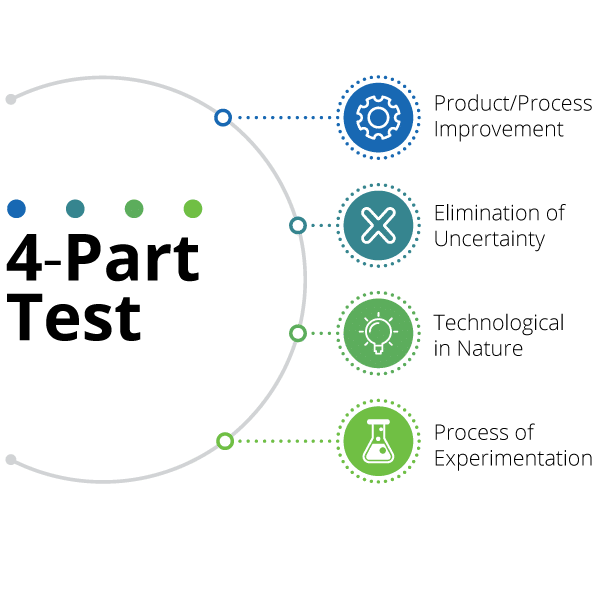 Process of Experimentation – Activities must follow a process of experimentation involving: evaluation of alternatives, confirmation of theories through trial & error, testing, modeling, and/or refining or discard of the hypotheses. Advancing the design of an existing product or process. Correcting significant design defects, obtaining significant cost reductions, or enhancing function. Designing, constructing, and testing of preproduction prototypes & models. Conceptually formulating, designing, and testing of possible product or process alternatives. Launching actvites involving a new component or process. Designing time, tool designing & testing, prototype building, etc. Engineering efforts to develop new plant processes. Technically redesigning existing plant layout, resulting in substantial production gains. Making efforts to solve production problems where there was uncertainty as to the best solution. Designing and testing involved in improving the configuration or altering the composition of an existing product or process to increase efficiency or decrease cost. How Can Grennan Fender Help? Grennan Fender evaluates your specific situation to optimize credits, thereby reducing your tax burden. Come speak to us today for our no charge feasibility study to see how you might benefit!